Among many other meaningful activities, such as creating complicated weave structures on her loom and collecting Romanian folk art, traditional artisan Lucia Ciocoiu sits sewing peasant blouses in the garden. Within and without, all is quiet and content. The birds sing and the butterflies flutter athwart her trimly kept garden. Her eyes fixed on her embroidery and the needle flies swiftly backwards and forwards in her fingers. After winding a warp and weaving, she cut the freshly woven fabric pieces out for a traditional Romanian blouse, called “ie”. The ornamental fields of the blouse, consisting of geometrical rows (râuri) stream from the collar all the way down to the ruffled cuffs (fodori) and on the chest, are loom woven before cutting. This stage takes no less than one week, as the ornaments are woven by use of an additional heddle system, a painstaking process which requires the assistance of a second weaver to pick up the pattern. Next comes the cutting, sewing and detailing which can take up to two more weeks. The most common cut given for blouses nowadays is the neck gathered cut, since the straight tunic cut design has been faded out due to that fact that it might be considered old-fashioned. The sleeves, front and back parts are gathered and pleated at the neck with lace, band (obinzală), or string (brezărău). The brezărău passes through the material or through a crocheted collar. The bottom extension, worn with a pair of traditional aprons (cretințe), can be found separated, sewn, or built-in. The most important stage after the parts are cut out is the sewing together. The front and back are sewn together, as well as the parts of the sleeves. The structure of the sleeve consists in two rectangular pieces of fabric, brought together with joining seams. Then the sleeves are sewn into the blouse with two pieces of cloth, “broscuțe”(lit. “frogs”), used to sew the sleeves underarm. 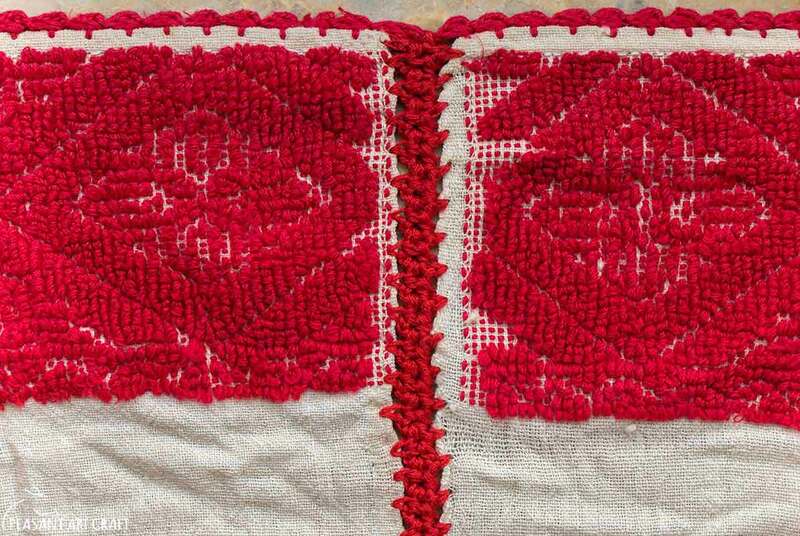 This can be done through a series of functional stitches, among which the most widespread is the “cheiță”, a complex decorative joining stitch, worked with cotton in white, or in a contrasting color.